Amid constant speculation that Apple is working on bringing its own car to market, the company has taken control of not one, but three car-related top-level web domains. First appearing on January 8th, apple.car, apple.cars and apple.auto may not be live as yet, but all three are indeed owned by Apple via registrar MarkMonitor Inc.
Apple’s new websites appear to have first been registered in December of 2015, and although none are yet pointing to live websites, it’s a fairly safe bet that they will eventually be used by the company. What they are used for, though, is not yet obvious. That’s because while there are constant rumors that Apple has plans to launch its very own electric + autonomous car, it’s also possible that the new domains will actually be used for something CarPlay-related. Apple’s in-car entertainment system that allows car manufacturers to hook into iOS via an attached iPhone is still in its relative infancy and hasn’t quite taken hold yet. The reason for that is partly thanks to the fact that getting CarPlay functionality usually means buying a brand new car, though there are some aftermarket options available now as well. Perhaps the best way to get CarPlay will be to get your very own “Apple Car”, and while these new domains obviously don’t confirm the existence of such a thing, Apple’s recent history of hiring engineers away from car firms as well as those familiar with batteries and the like from Tesla does point to something going on over in Cupertino. Apple CEO Tim Cook’s visit to a BMW factory in Germany last year gave further weight to Apple Car-related rumors. 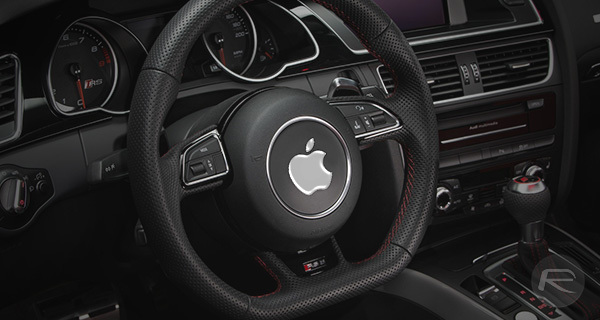 If Apple does start selling its own car at some point in the near future, though, we think the most obvious question hasn’t yet been asked – just how does Apple plan on getting its car onto one of those wooden tablets the company uses in its Apple Stores?